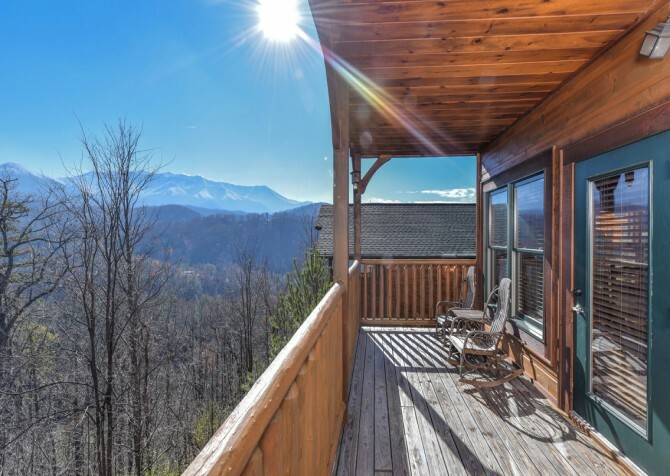 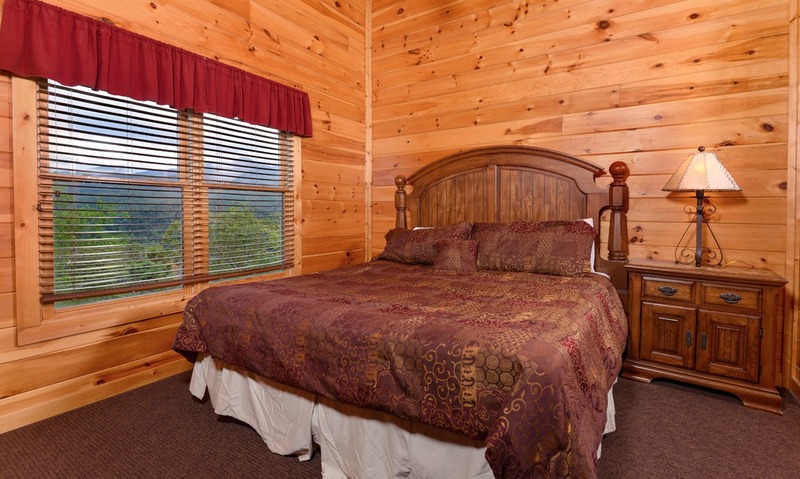 With glorious mountain views eager to greet you at the start of every day, Morning Glory rests less than five minutes away from downtown Gatlinburg, sleeps up to 14 guests, and provides more than enough amenities for all your vacation needs and wants. From a relaxing outdoor hot tub and a warming stone fireplace to a private home theater and a rec room filled with games, boredom won’t come easily in this cabin. 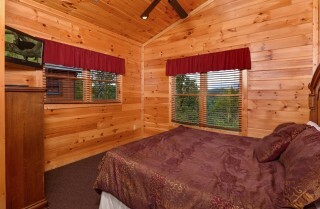 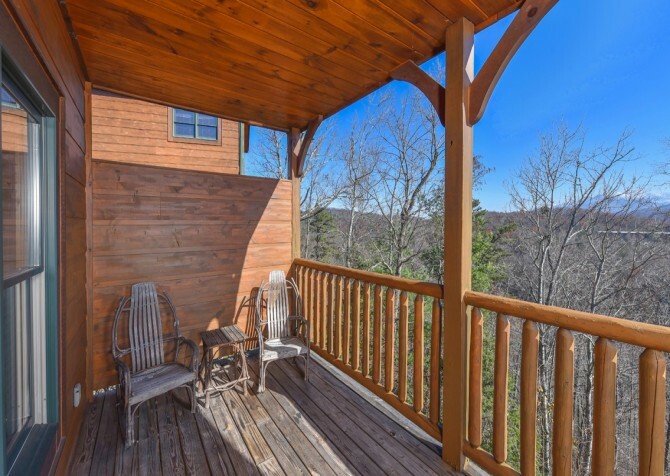 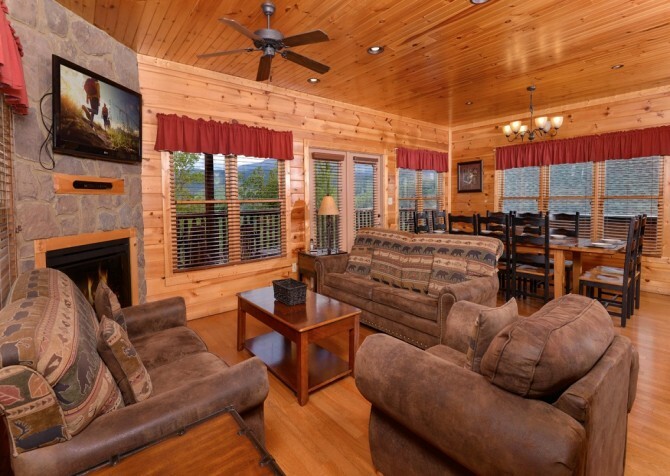 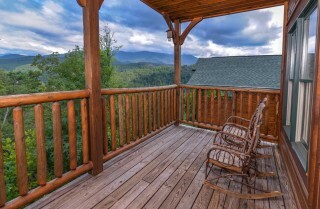 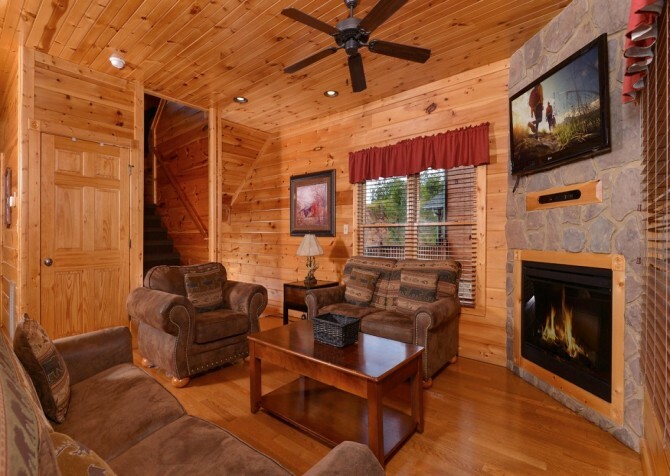 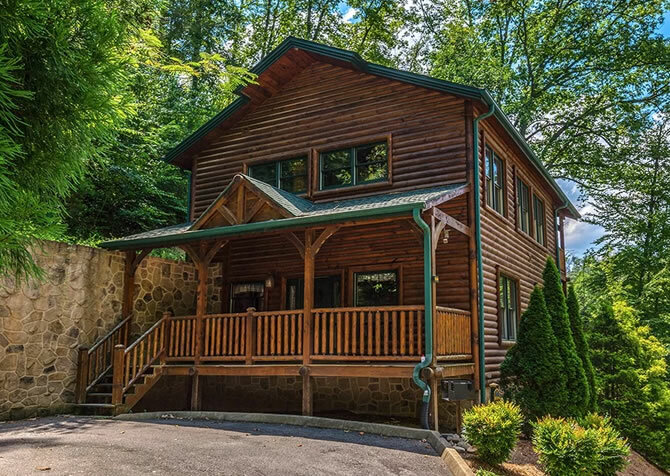 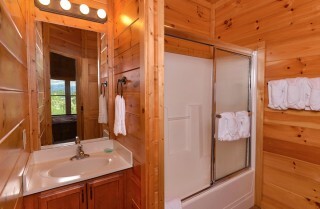 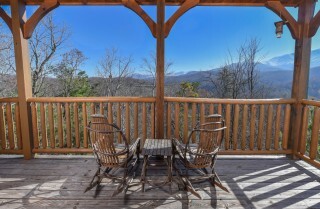 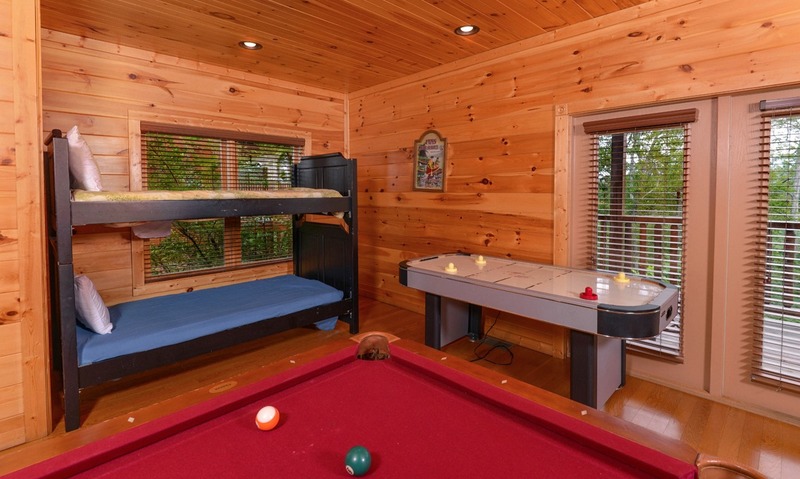 This 3-bedroom, 4-bathroom cabin in the Gatlinburg Falls – Parkview Resort offers the feel of home – but better. 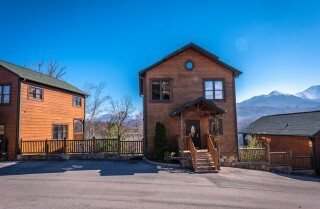 Retreat to a king-size bed at the end of the night, play games and have movie marathons, enjoy family-style meals at a table for 10, sip moonshine as you soak in mountain views, splash in summer at the community pool, or take the short drive to downtown Gatlinburg (less than 3 miles!) for attractions, restaurants, unique shops, live music, and so much more. 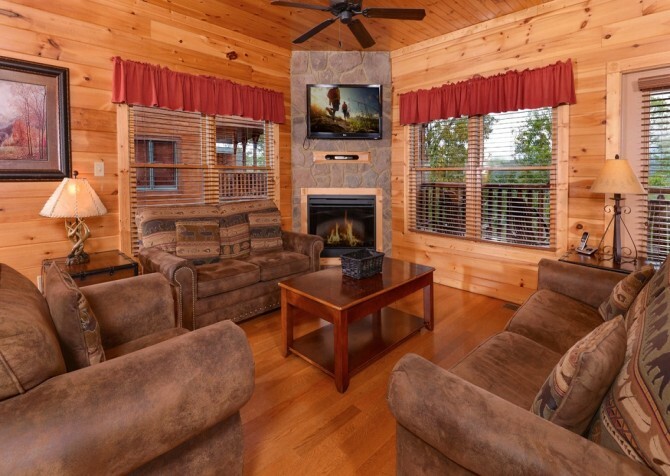 Perfect for taking a load off after your exciting Gatlinburg adventures, this cozy living room located on the entry level features a sleeper sofa with a matching love seat and arm chair, a flatscreen TV accompanied by a DVD player, and a gas fireplace with stone details for a mountain feel. 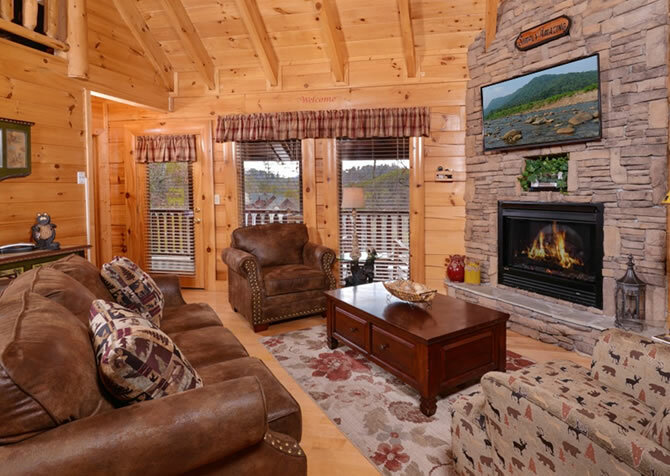 With 2 end tables and a wooden coffee table, there is plenty of space for everyone to rest their hardworking coffee mugs in the morning, afternoon, or night — this is your vacation after all! Get a fire going for your nightly chats while your little ones watch a Disney classic, or easily pull up some of the dining chairs for a friendly — or fierce! 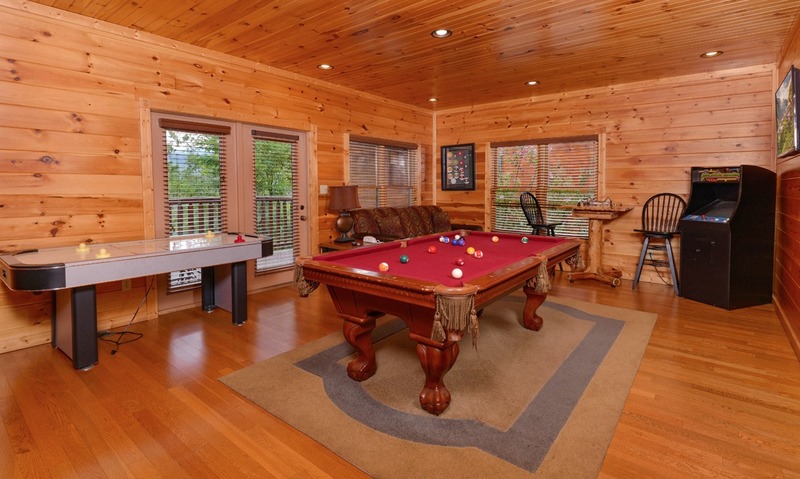 — round of charades. However you use the space, it’s sure to be a hub for family and friends to make lasting memories. 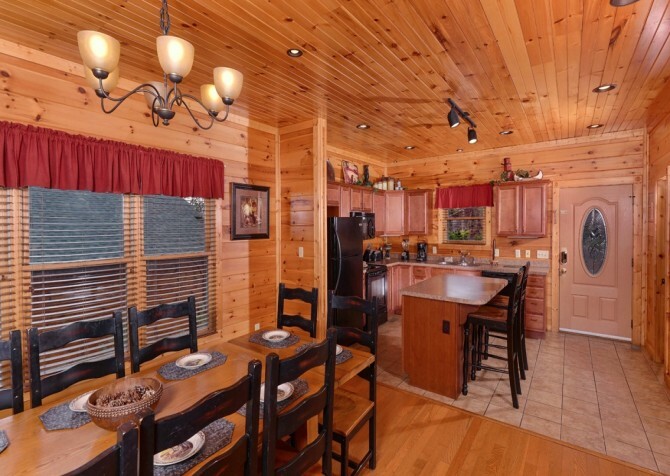 As you enter the cabin, you’ll step right into the fully equipped kitchen, complete with all the appliances you’ll need for your stay. 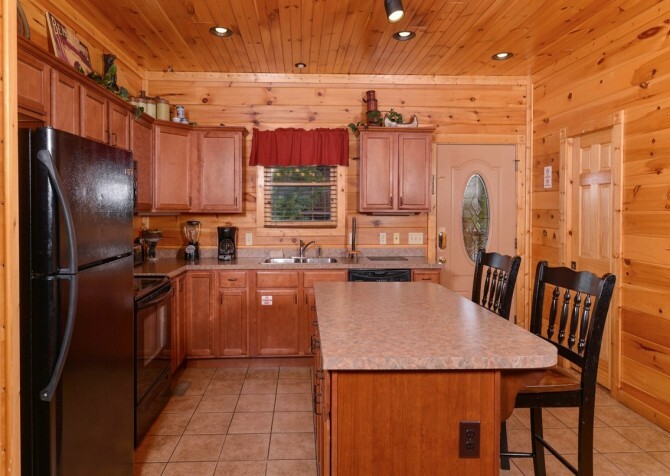 A refrigerator, stove, microwave, toaster, blender, coffeemaker, and a (perhaps most importantly) dishwasher complete the lineup in this well-equipped space. With bar seating at the island in the center of the kitchen, your friends and family can keep you company while you cook — and help chop a few veggies or mix a few batters, of course. 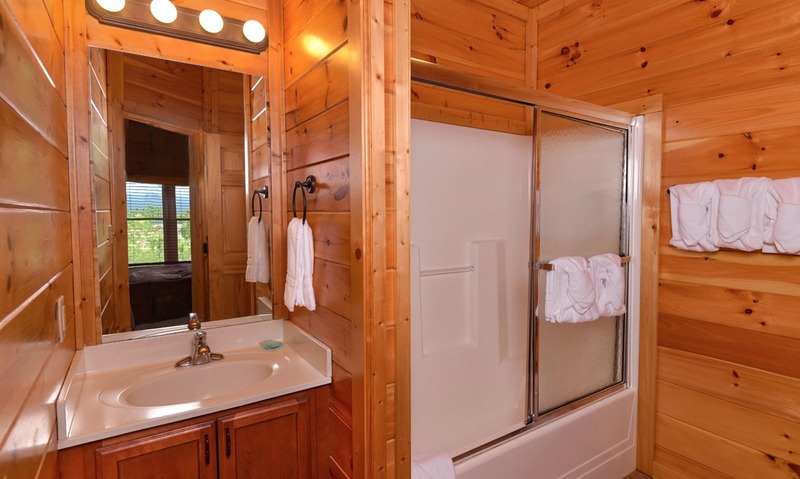 There is also a stainless-steel double sink with a sprayer perfect for giving dishes a quick rinse before letting the dishwasher do the rest of the work. Plus, an open floorplan allows you to keep an eye on the wooded landscape through the back windows as you prepare your scrumptious meals, making cooking in the kitchen a pleasure and not a chore. Just off the kitchen is the dining room, where you can share meals and simply admire the Smokies from the table. 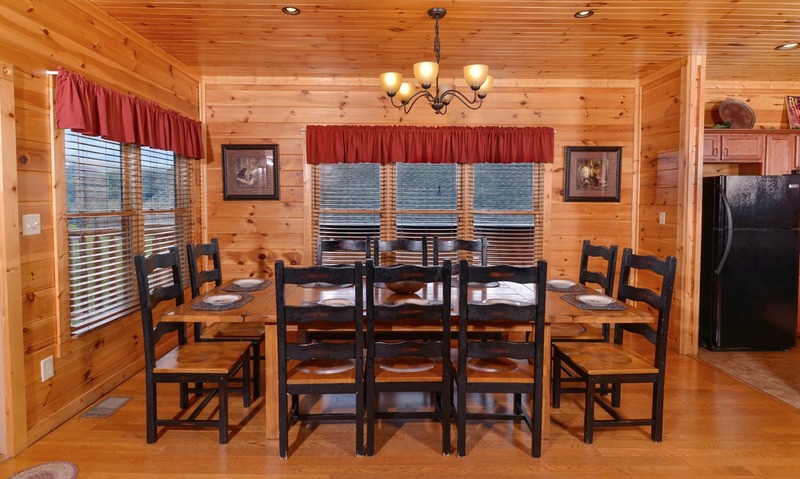 With seating for 10, you’ll have room for family-style meals, holiday spreads, and nights sipping wine with friends. 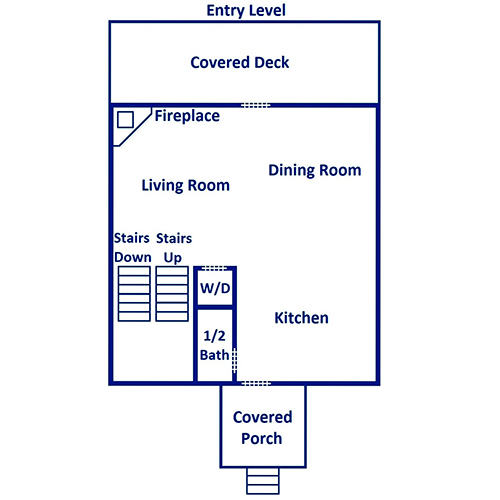 With a wrought-iron chandelier overhead and natural light pouring in from surrounding windows, feel free to take inspiration from the scenery and bring along art supplies for some on-the-spot sketches and drawings. 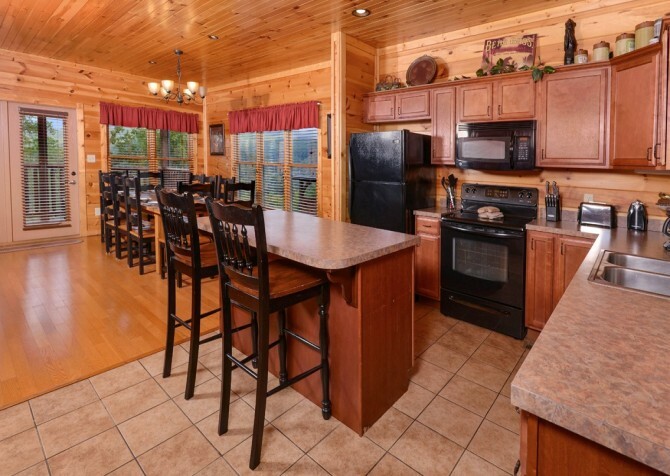 Even if you’re not doing your own cooking, you can order pizza, have a catered BBQ dinner, or just pick up fresh baked goods from The Old Mill and The Apple Barn for an easy and delicious local breakfast. 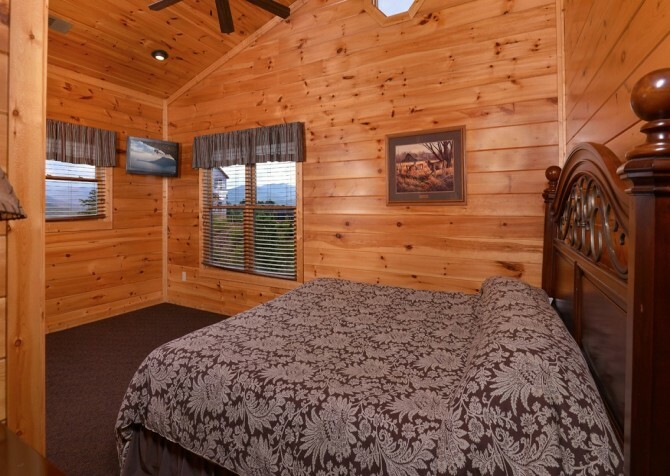 Each of the 3 bedrooms is its own suite — you can’t beat that! 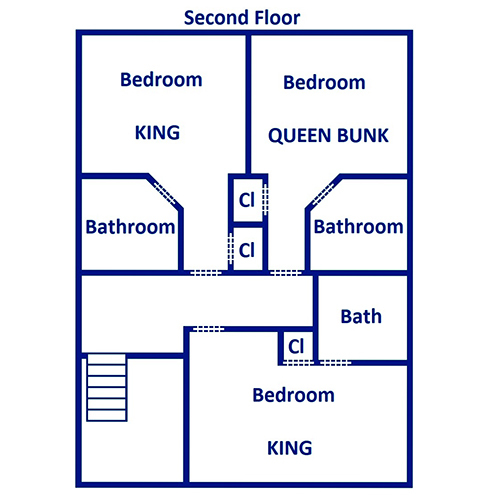 Plus, with 2 additional half baths in the home, you can experience the freedom of getting ready without your whole group fighting over the same bathroom. King-size beds can be found in two of the bedrooms, and in the other is a queen-size bunk bed with plenty of head room — so they’re not just for the kids! Of course, all the bedrooms come with a dresser and an end table to keep your belongings packed away. 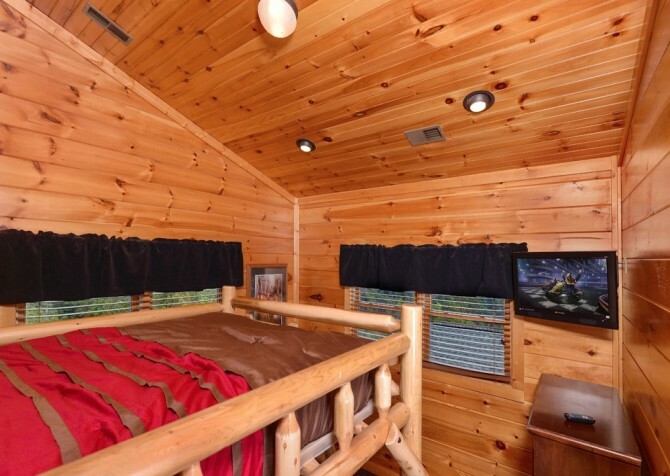 Furthermore, a TV is provided in every bedroom, so you won’t have to settle arguments over what to watch on your vacation, which is a noteworthy bonus. 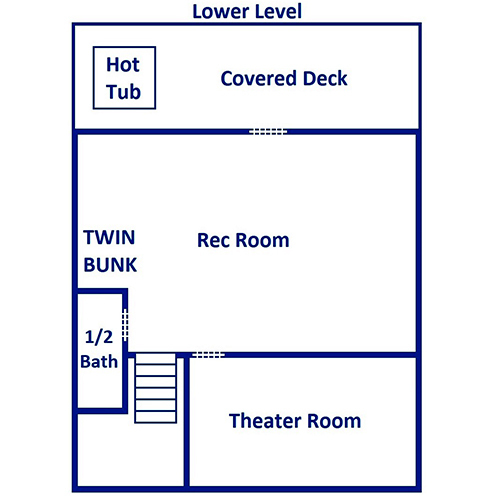 Get ready for an epic game battle in the rec room! From pulverizing your siblings at pool and missing the air hockey puck on purpose (to give the other a fair chance against your mighty skill of course) to bragging about the highest score on the multicade (a classic arcade game unit) and bowing out gracefully at the intimidating chess (or checkers) table, there’s no shortage of recreational activities in this cabin. 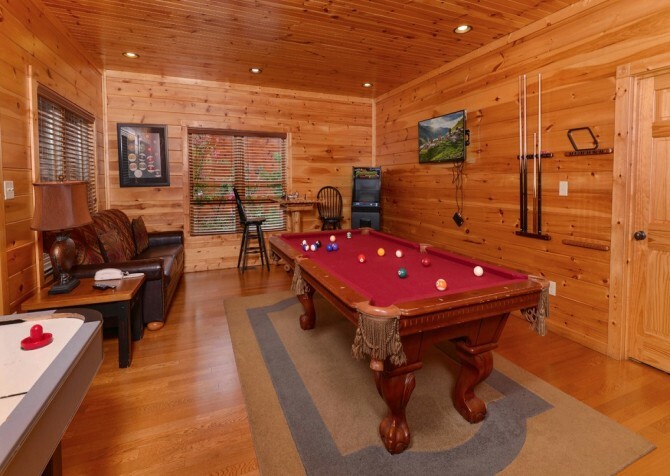 With multiple outlets throughout the room, you can keep your phones happily charged and ready for those victory selfies! 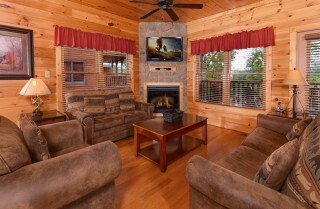 If observing games is more your style, why not flip on the mounted flatscreen TV while chilling out on the sleeper sofa? 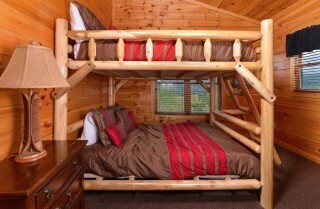 You’ll also find a twin bunk bed in this room, so the kids can play all night and pass out — at least near a bed. 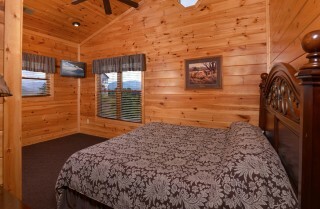 Let them joyously tucker themselves out while you get some well-deserved shut eye in your own suite. 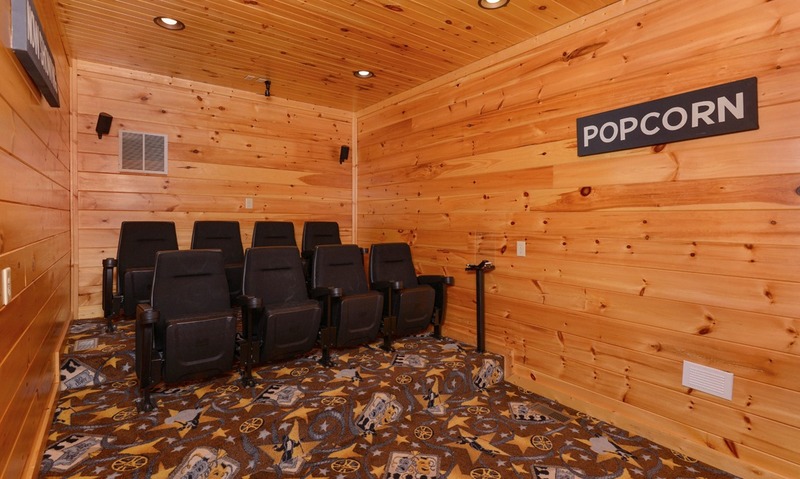 Bring on the buttery popcorn, sweet candy, and chocolate treats, because it’s movie night! 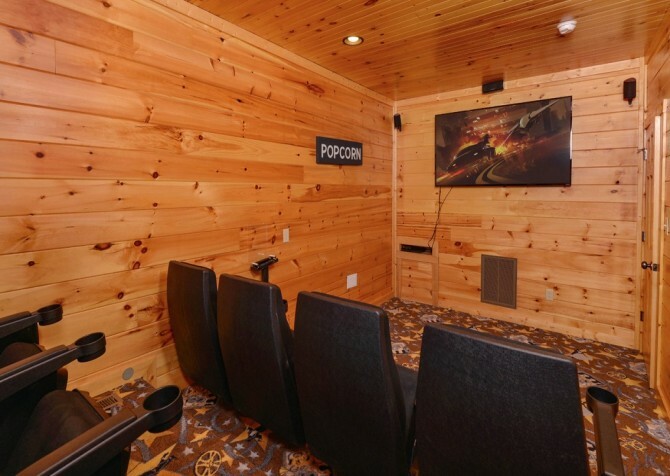 Located right off the rec room, this private home theater features 8 cushioned theater seats with built-in drink holders and a large space in front that’s perfect for pillow pallets. 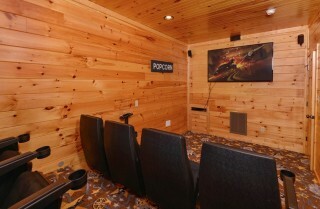 There is, of course, a big screen TV and surround sound — so you can really feel the action. With recessed lighting and no windows, it’s just like going to the movies, and the best part is, you can go in your PJs! 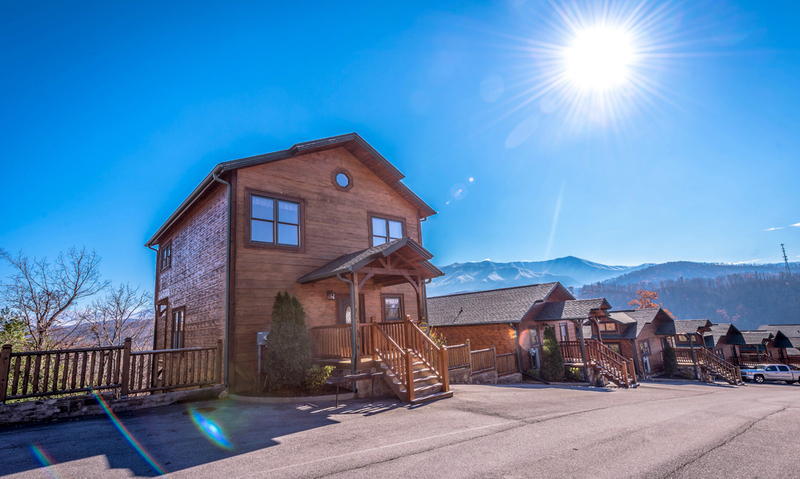 As you approach your vacation retreat, you will first notice the paved parking for 4 and charcoal grill just at the front, which is more than ready for your barbecue shindig. 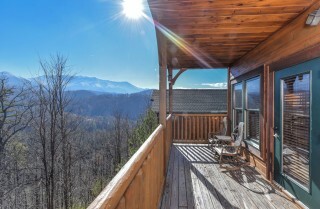 As you make your way through the kitchen and living area, you will see the entry-level back deck furnished with unique wooden rocking chairs that seem as if nature itself formed them. 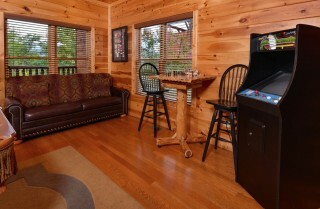 There are also matching end tables to hold your morning coffee, afternoon tea, and evening cocoa. Additionally, a privacy wall can be found to the left, so you can unwind in true comfort! 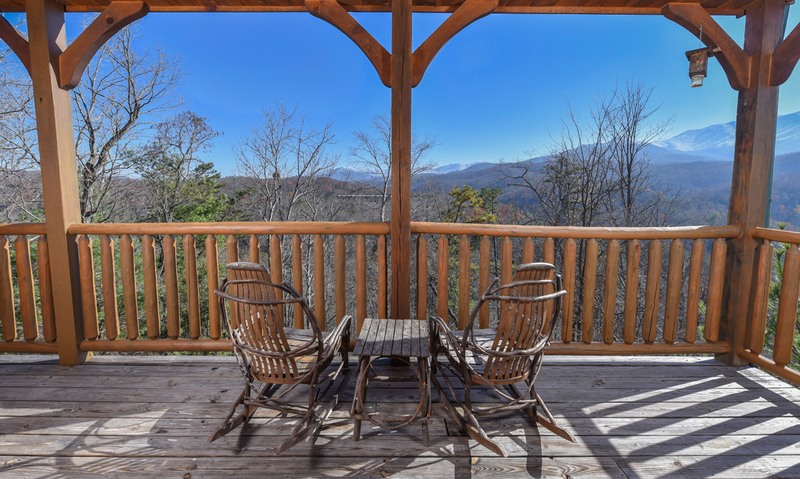 Take a seat, relax, and look out in peace as the shadows of the clouds cascade softly over the mountain range, creating a sense of calm unlike any other. Just below, you will find the lower level deck where the soothing hot tub resides (next to a privacy wall) ready to relieve your aches and pains. 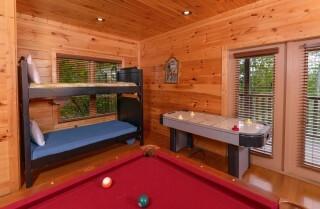 There is also a small table beside it to keep your towels dry. 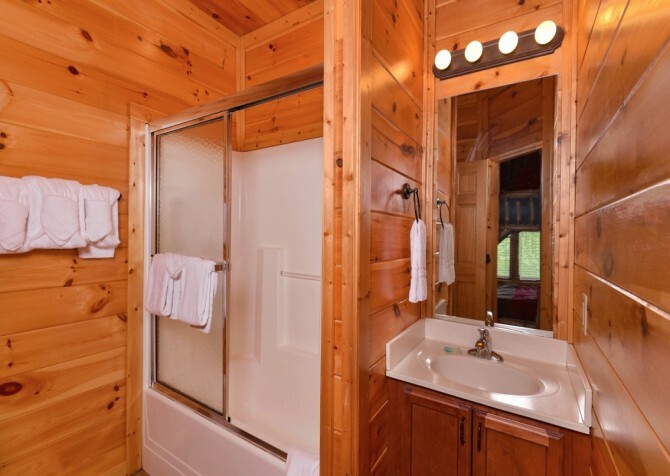 Want to pack light or go home with a suitcase full of clean clothes? There is a washer and dryer for your laundry needs — barbecue can be messy. 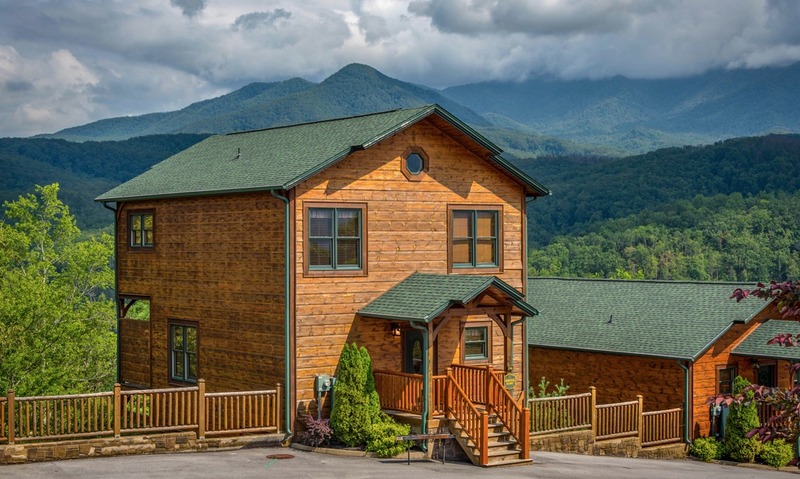 Along with all the in-cabin amenities, Morning Glory is a part of Gatlinburg Falls: Parkview Resort, which provides community access to an outdoor pool (typically open from Memorial Day through Labor Day). 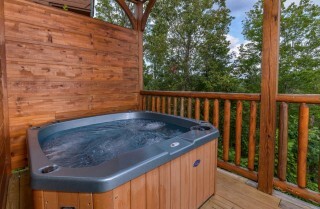 Go for a leisurely swim, take some morning laps, or soak up some sun while the kids splash around. With lots of local attractions to explore and sights to see, it’s hard not to have a good time in Gatlinburg. Read on for a few of the more interesting options for your upcoming vacation. Being the only attraction for musical comedy entertainment in Gatlinburg since 1977, a barrel of laughs is what’s in store for you at the Sweet Fanny Adams Theatre. With singing, dancing, acting, and more, you’ll leave smiling for days. 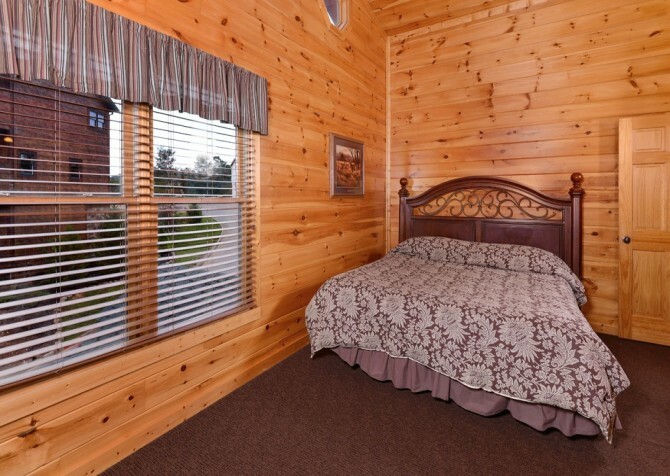 If you’re in a more adventurous mood, check out the Ripley’s Believe It or Not! 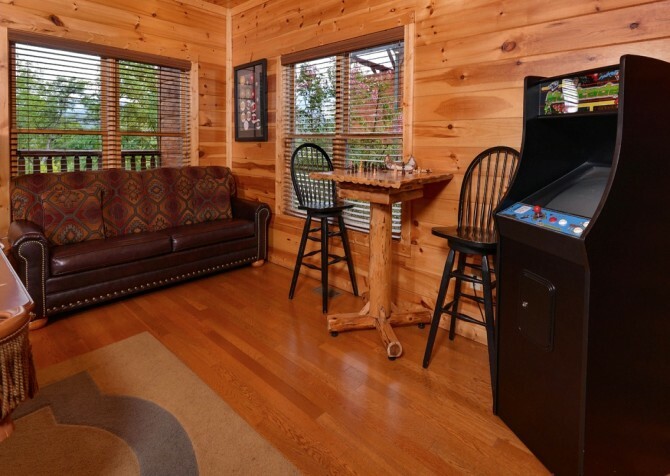 Odditorium, which showcases more-than-odd oddities, including shrunken heads. For a good scare (only 3 minutes away from the odditorium), visit the Mysterious Mansion, which is the oldest haunted house in Gatlinburg — just imagine what creatures await you in those halls! 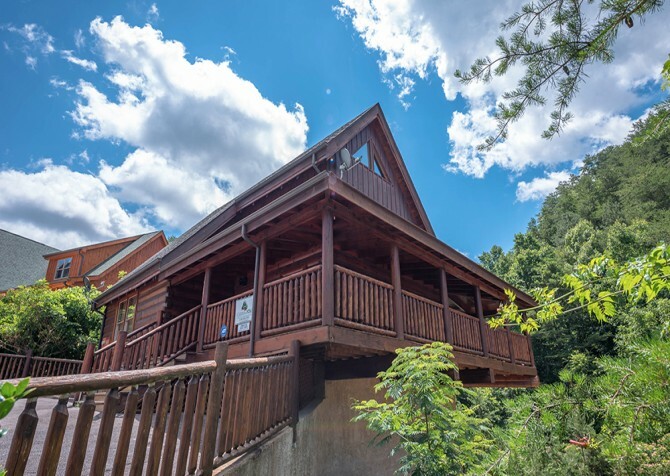 Appease your sweet tooth for nature by heading over to the Sugarlands Visitor Center in the Great Smoky Mountains National Park. 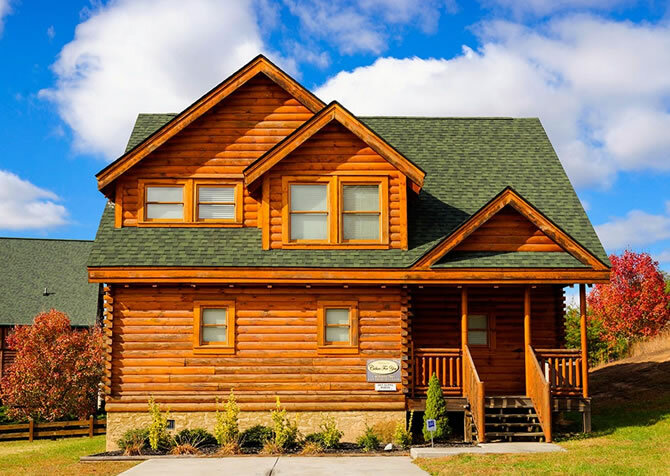 Watch a 21-minute film about the area, ask all your bear questions to real park rangers, and view a natural history museum all for free! "Great place to stay for smoky mountain adventurers!"